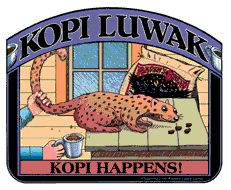 Ovah Coffee: Kopi Luwak - The Poop Coffee, Dare To Try? Kopi Luwak - The Poop Coffee, Dare To Try? Two nights ago, while Bebe's been Googling around for online grocery stores within Sweden where we can possibly find Filipino items, has stumbled upon the Extreme Food Swedish page. It is there where his attention's got fixated on Kopi Luwak, the poop coffee. "Oh my. Oh my. Oh my. ", have been my first six words after learning about it and "What??? No!!!" [with jaw dropped] are my follow up reaction after reading the part where it states that Kopi Luwak is actually dubbed as the world's most expensive coffee. Prices may range from 100 USD to 600 depending on where you buy it from. There are even some special varities that come with an astonishing price tag of up to 6,600 USD. Here in Sweden, 30 grams of Kopi Luwak is sold at 200 Swedish crowns or SEK [about 6,600 SEK per kilo or +/- 985 in US dollars per kilo]. That's totally insane! Though Kopi Luwak is mostly produced in Indonesia, it is also manufactured in some parts of the Philippines and is called Kape Alamid. I haven't seen this type of coffee yet in my country but now that I know that it exists in the Philippines, I'll search for it there during my next vacation. According to a friend [Tita Fely --- thanks for the info], Kape Alamid only costs Php600/lb. Way lot cheaper, eh? So, would you dare taste it knowing that it's poop coffee? Oprah Winfrey, on her 15 October 2003 show has featured Kopi Luwak, tasted it and actually liked it. So, if Oprah says it's good, I might dare try it one day. How about you? Would you? Dare to try? Me, too. I am a coffee lover that's why I'll definitely try it one of these days! Hugs from me to you!